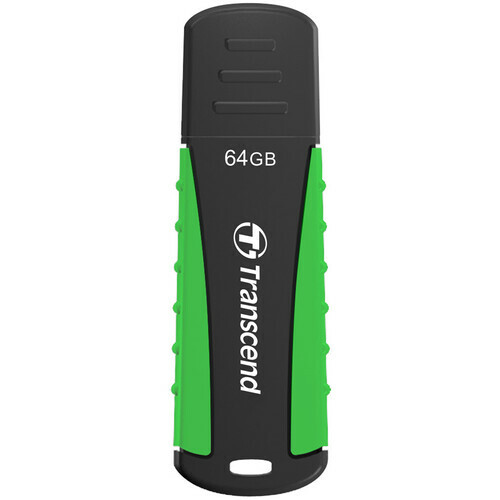 The green / black 64GB JetFlash 810 USB 3.0 Flash Drive from Transcend is a flash-memory storage device featuring maximum read and write speeds of 85MB/s and 25MB/s, respectively. Included is a free download of exclusive Transcend Elite data management software. The drive's rubber housing is shock-resistant, meeting MIL-STD-810G 516.6 military drop-test standards, and also safeguards against splashes, moisture and dust. Its color helps it stand out for easy visibility. The drive offers plug-and-play operation and is compatible with Windows 10, 8, and 7, as well as Mac OS X 9.0 or later and Linux Kernel 2.4.2 or later. Transcend Elite is a downloadable software utility that includes user-friendly applications that help users manage data and increase productivity. When paired with Elite, your Transcend storage devices make it easy to keep important files organized, protected, and up-to-date. Perform instant backups and scheduled backups. Switch on/off OTB (One-Touch Backup) setting to allow the one-touch backup function. Protect files with 256-bit AES encryption. Decrypt files that had been encrypted by the Transcend Elite data management utility. The Windows version of Transcend Elite lets you synchronize files on in a source folder and a destination folder. Back up files from Google Drive or Dropbox to Transcend's storage device using the Windows version of Transcend Elite. Box Dimensions (LxWxH) 5.2 x 4.1 x 0.3"
64GB JetFlash 810 USB 3.0 Flash Drive (Green/Black) is rated 4.0 out of 5 by 4. Rated 3 out of 5 by Panoramic Fanatic from Good entry to 64GB, but slow for USB 3 I purchased this for storing very large image files. So far, it has functioned well, but not stellar. The write transfer rate of around 15 MB/s is slower than advertised (25 MB/s), and the rubber cap is cheap and fits loosely. Be aware that the online encryption software offered by Transcend is apparently only for file encryption and not password encryption. Rated 3 out of 5 by Panoramic Fanatic from Good entry to 64 GB, but slow for USB 3 I purchased this for storing very large image files. So far, it has functioned well, but not stellar. The write transfer rate of around 15 MB/s is slower than advertised (25 MB/s), and the rubber cap is cheap and fits loosely. Be aware that the online encryption software offered by Transcend is apparently only for file encryption and not password encryption. Rated 5 out of 5 by Runner from Great Flash Drive Works well. Right price. Makes a great gift. I carry it with me everywhere. Rated 5 out of 5 by Devastacia from sturdy and fast It does what it says. I am totally happy with this thumb drive. How do I use this to delete the pictures that are on it? Asked by: Henk & Dianne Z. The Transcend 64GB JetFlash 810 USB 3.0 Flash Drive is a standard storage device. On a Mac you can delete files, including photos by dragging them to the trash, then empting the trash. On a Windows computer you would drag the files to the recycle bin, and then empty it. If you are using an alternate operating system you would need to refer to its documentation for additional information.